Wait – still in Maine! I HAVE been swept away by a fog! Oh the Fifty Shades of Maine! We sailed from Bar Harbor to Swans Island today. The downwind sail was steady with a few jibes here and there to stay on course. Staying on course, that was the challenge! 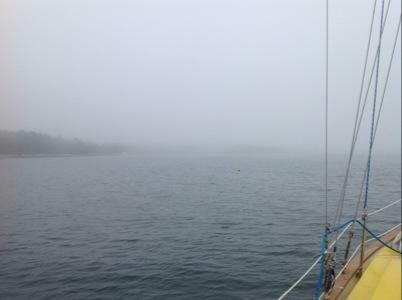 As we approached the Cranberry Islands fog started rolling in. Very slowly each island disappeared! And of course, we continued onward. What better way to learn than by experience. We had a good lesson in Radar and followed our charts closely to look for navigational aids. The Radar was a necessity to anticipate approaching boats as they seemed to also just appear. 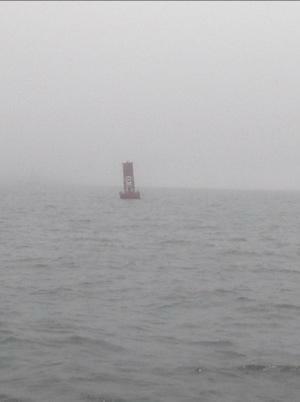 We couldn’t actually spot the navigational aids until we were nearly on top of them, just about 50 feet away. Our visibility was LOW. 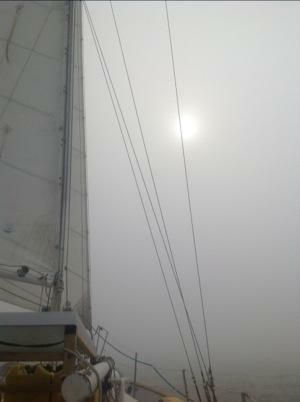 We knew the sun was still shining and hoped the fog would clear as we approached Swans Island. It cleared slightly and we had better visibility near land. We were able to anchor safely, tucked into Mackarel Cove. To brighten our day, a seal greeted us. We caught a second glimpse of him as Brian was setting the anchor. He was very curious. 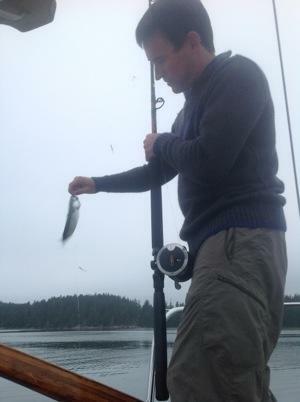 Brian caught his first fish of the trip, a mackerel. Very fitting for our newest location in Mackarel Cove. He was too small for supper so Brian set him free. The pea soup fog in Maine can be so sudden and so thick! Glad you are all tucked in.